And you can tell non-Montanans from natives by pointing to it on a map and asking them if they've been there. 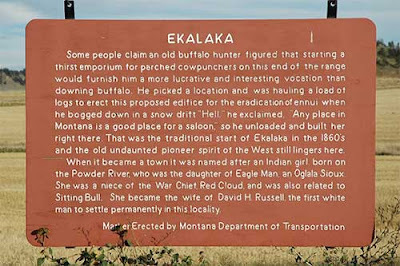 The natives will laugh and ask why in the world they would've gone to Ekalaka (pronounced right) and the non-Montanans will mangle the name and ask if that's a real town. Yeah, when I was thinking of cool Montana town names, most of the others I thought of were ghosts. I've always liked "Copperopolis," which was out by White Sulphur Springs ... oh, and "Vananda," which is out in your part of the world. And I definitely don't know many folks who have been to Ekalaka! I'd wanted to go there for years ... it was the only Montana county seat town I hadn't been to. When I finally made it there, I was suitably impressed ... the country around there is great, and the people were friendly, and there's a fine little museum. Wait, I just thought of another one: Rapelje! I have a hard time thinking of odd Montana town names because I've been looking at them and hearing them all my life...so even the odd ones are "oddly familiar"! Rapelje sounds Dutch, doesn't it? Yes, come to lovely Cohagen! I'd wait until June, though...it's pretty dismal right now. My husband and I were laughing, last night as we took the kids trick-or-treating, because the lights from the neighbors barnyard were more numerous and impressive than the Cohagen "town" lights. Though I probably won't get out your way for a while, I actually like exploring out in the prairies this time of year ... as long as I don't get stuck, or something. The winter light is great for photographs. My least favorite time to be out in Montana is probably March, when everything is all muddy and brown and we all just want it to be summer.